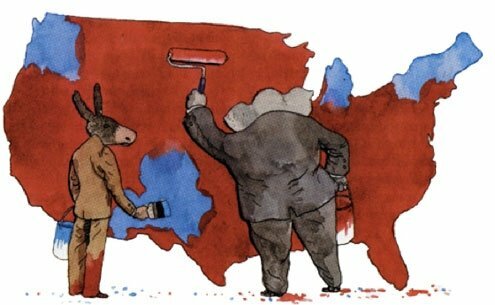 Gerrymandering can reinvent whole areas to suit purely political interests. n 1880, Captain Charles Boycott, the agent of an absentee landlord, attempted to evict 11 Irish tenant farmers from their lands for protesting high rents during a year of poor harvests. Boycott sent in his own “scab” harvesters, raising the ire of the evicted and the risk of serious violence. Speaking to protesting farmers, nationalist leader Charles Stuart Parnell appealed for cooler heads, proposing that the scabs simply be shunned. The community focused instead on Boycott. His farm hands stopped working for him and businessmen ceased all trade. He was isolated and ultimately ostracized. Boycotts have a history of bringing about change. Boycotts against South Africa (for its practice of apartheid), the Montgomery Bus Boycott, and consumer boycotts of the East India Company (the Boston Tea Party), Wal-Mart and Ford are all cases in point. So was the political “Boycott Bush” campaign set up by Ethical Consumer after President George W. Bush failed to ratify the Kyoto Protocol. The campaign went after Bush’s corporate backers and the products they produce. In 1812, Massachusetts Governor Elbridge Gerry approved a congressional redistricting law that favored his political party, the Democratic-Republican. The law created a new voting district that Federalist newspapers likened to a salamander. “Gerrymandering,” or self-serving redistricting, became his political legacy. Stacking the political deck in favor of incumbents and party loyalists — a problem that has persisted over centuries in the United States — has long been a global problem. But Italy, with its proportional representation system, has not needed to engage in gerrymandering. In fact the only re-districting that has occurred seems tied to personal self-aggrandizement when Dictator Benito Mussolini, seeking to burnish his legend, famously altered a boundary line so that the source of the Tiber River would be in Romagna, his regional birthplace, instead of Tuscany. Since the end of fascism, democratic Italy has enacted a number of complicated election laws. The most recent, passed in 2005, created so-called “bloc lists,” which all but forced voters to back political parties and not individuals. Individual candidates gained a seat in parliament based on the number of votes their party received in their district and their position within the party hierarchy. The largest coalition received a “bonus” in both houses of parliament to ensure majority rule. Critics labeled the law the porcellum, a pigsty, insisting it blatantly favored larger parties. In January 2014, Italy’s Constitutional Court definitively ruled that the bonus provision was unconstitutional, pushing the country back to a purely proportional election system until parliament can draft and pass a new law, which is proving difficult. Although the old law (and the new impasse) has drawn considerable foreign criticism, American critics should not throw stones. In some U.S. states — California, Arizona and Washington among them — redistricting has been taken out of the hands of politicians. But in 34 others, state legislatures still control the makeup of voting districts. In those states, ruling parties greedily redraw boundaries to protect incumbents and usher in favored newcomers. The process is so successful that some congressional races — gerrymandered to suit the needs of the party in control — go uncontested. North Carolina’s 12th Congressional District, in the central part of the state, and Maryland’s 3rd near Baltimore, are egregious examples of a system that has gone terribly wrong. These districts were drawn up by the party in power and packed with opposing party voters — in both cases Democrats. The redistricting process gave the majority party a leg up to continue running state government. Combine gerrymandering with other ploys, including putting limits on hours and days in which polling stations are open and establishing discriminatory voter ID laws, and the work of congress can seem little more than an exercise in protecting personal and party jobs. Along the way, votes are lost in an unbalanced and corrupted electoral process. The Constitutional framers saw redistricting as a way of balancing electoral scales. As states grew in size, they would also grow in influence. Instead, this growth has been co-opted by ethically vacant power grabs, in which some politicians effectively choose their own voters. The Internet may help by channeling voter resentment and giving citizens an opportunity to expose and boycott the powerful donors and political lobbies that encourage gerrymandering. But it’s not an easy task, particularly in the wake of a recent Supreme Court decision (McCutcheon vs. Federal Election Commission) striking down the concept of capping political campaign contributions. The ruling is likely to encourage the massive, agenda-directed campaign funding that has become the sad norm in much of America. More than ever, participatory democracy now demands a new set of principled choices. Voters need to decide whether to back candidates who are little more than the engineered products of a gerrymandered system or those who demonstrate an ethical sense of government and respect for the individual vote. Voting by party alone no longer suffices. It’s time to boycott those who support or encourage gerrymandering. That, more than the mere casting of a ballot, should be the measure of change. Don Carroll wrote the Closing Argument column from 2011 through 2018.